Invited by Oslo Open to take part in their visitor programme for curators. Being in the jury for Sørlandsutstillingen 2017 together with Pelle Brage and Anne Marthe Dyvi. Opening Saturday 11 February at 6 pm. and a presentation by The parallel university. Followed by an after-party at Teateret from 8.30 pm. Invited to give a small talk at the kick-off seminar for the municipality of Bergen's new cultural strategy for the arts (2018-2027). The given theme was on the role of the artist in society. On responsibility, urgencies, and cultural policy. The seminar was organized by the research group for subjectivation and late modernity at the departement of philosophy at the University of Bergen. Visiting Montreal in July 2015 for studio visists, exhibitions and meetings. 22nd – 26th June 2015. Within this symposium and its accompanying artistic programme we intend to problematize the shifting grounds of institutional evaluation and valorization in the art. Selection procedures such as curatorial concepts, institutional programmation, criticism, theory, funding priorities, project assessment, interpersonal connections, political clout and so on affect what is included and what remains outside the art system, but also how artworks engage with the broader socio-economic context. They define the types of work that are produced and that are not, the types of of work that are presented and that are not. In turn they re-configure subjectivities involved in the process of artistic production — i.e. roles and self-understanding of artists, curators, spectators, audiences, funders, etc. However, the works that fall outside, escape and subvert these quantitative and qualitative boundaries of assessment, sometimes succeed in re-configuring the filtering mechanisms of valorization and sediment in the institutional knowledge that is applied toward future valorization. This is artistic ‘dead labor’ sedimenting in the circuitry of institutions. And while this dialectical process has been a constant topos of institutional critique, we want to focus on contemporary and ascendant forms of valorization and subjective determinations that they reproduce – for instance: project, practice, didactism, realism, etc. – and look at the works that try to undercut their centripetal force. Art, Institutional ‘Dead Labor’ and Limits of Valorization is part of TIMeSCAPES, Images and performances of time in late capitalism, a partner project of BADco. (Zagreb), Maska (http://www.maska.si) (Ljubljana), Science Communications Research (http://www.science.co.at/) (Vienna), Walking Theory (http://www.tkh-generator.net/) (Belgrade), Film-protufilm (Zagreb) and Academy Of Dramatic Arts, University of Zagreb. With the support of the Culture Programme of the European Union. With support of the Ministry of Culture of Republic of Croatia and the Office for Education, Culture and Sport of the City of Zagreb. Bergen National Academy of the Arts is arranging a seminar and workshop series to provide a theoretical and critical frame of reference to the workshops and festival. Pro tempore presents different contemporary artistic practices from the south coast region in Norway. In the centre of the exhibition is a long shared table, onto which several of the artworks are displayed. The table also functions as a meeting place, a place for workshops, collaboration, exchanges and cooperation. The exhibition presents several time-based works, including live radio, performance, film, video and sound installation, in addition to two ongoing projects throughout the exhibition period: The parallel university with a program of talks, lectures and discussions, and a drawing club which invites the public to come and draw together. , Lina Cepulyte, Yngvild Færøy & Søssa Jørgensen, Kirsti van Hoegee, Jonathan Mayhew, Knut H. Odden, Karen Pettersen, Mathilde Pettersen, Jadwiga B. Podowska, Ane Sagatun, André Tribbensee, Marit Viljugrein, Lasse Årikstad. Photo credit: Petter Sandell, Jonathan Mayhem. 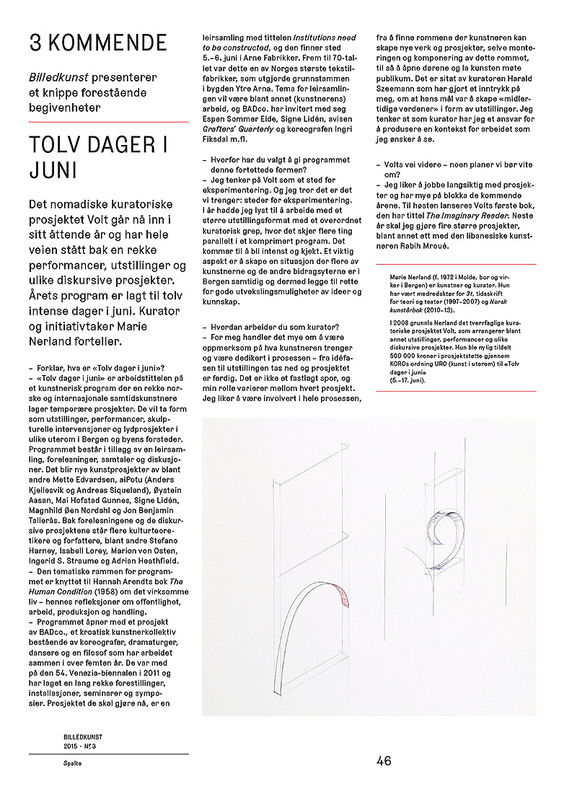 The Norwegian Art Yearbook and Torpedo invite to a panel conversation with Audun Eckhoff, Per Gunnar Eeg-Tverbakk, Linus Elmes, Steffen Håndlykken and Randi Thommessen. The conversation moderated by Marie Nerland. The participants represent a wide range of art institutions from artist-run places, a membership organization, private gallery to museum. They are gathered to share some of their experiences from their work with among others exhibition production and institution building. The goal is to create a conversation that cut across traditional boundaries in the art world, and that goes to the core of what it is like to work with contemporary art in Norway. Audun Eckhoff is an art historian and director of The National Museum of Art, Architecture and Design since 2009. Former director of the Bergen Art Museum (2002-2009) and curator at the Museum of Contemporary Art (1995-2002). Per-Gunnar Eeg-Tverbakk led the project Kunstneriske forstyrrelser (Artistic Interruptions) in Nordland and has curated numerous exhibitions, including Momentum 04 (with Caroline Corbetta). Director at Kunsthall Oslo. Linus Elmes is an artist, curator and writer with a background from several artist-run projects among them ak28 and Ersta Konsthall. Director of UKS from 2009. Steffen Håndlykken is an artist and has since 2010 run the gallery 1857 together with Stian Eide Kluge. 1857 shows work by young international artists, and emphasizes on producing new works in close collaboration with the artists. Marie Nerland is co-editor of The Norwegian Art Yearbook (2010, 2011, 2012). Since 2008 she has run Volt in Bergen. Randi Thommessen is trained artist and curator. She started Lautom Contemporary in 2007 in Oslo. Lautom shows Norwegian and international contemporary art and has participated in several international art fairs. The evening is arranged by Norwegian Art Yearbook in cooperation with Torpedo. An evening with Stefan Kaegi from Rimini Protokoll. Rimini Protokoll is often announced as the inventors of a new form of documentary theatre, exploring a theatre of performers who are not professional actors but experts or specialists out of their particular spheres of life – professionals of a theatre of the real world. Rimini Protokoll consists, besides Kaegi, of Helgard Haug and Daniel Wetzel, who in various constellations have made theater-related work, live art, pieces for radio and installations together since 1999. “Rimini Protokoll brings real life to the stage in a way that no other theatre form has been able to. The unmistakable strength of these performances lies above all in the fact that in spite of the proximity to the persons whom they portray a rift appears between the role and the personality, and with it an awareness of the risk, that life could gain the upper hand, and theatre could lose control over itself” (from Frankfurter Rundschau).